How many times have you looked at your bank account at the end of the month and wondered where the money went? In a new survey, TD Bank tries to answer that question, examining what consumers buy and how they pay for it. The typical U.S. household earns $62,000 a year and spends, on average, $25,000 of that amount paying the monthly bills and making purchases. The average household spends around $2,000 on travel and $1,700 on dining. Millennials tend to spend nearly $300 more than the average consumer on restaurants, pushing that total to around $2,000 a year. Earlier this year Business Insider broke down the costs and found the average consumer spends most of his or her money in three areas -- housing, transportation, and food. It also found that consumers spend a lot more than the average TD Bank came up with. Citing the Bureau of Labor Statistics, the report says households spend an average of $56,000 a year. Housing, transportation, and food claim about 62 percent of that, the report found. To save money, the report suggests consumers try to lower their housing costs, eat more meals at home, and drive a used car or take public transportation. TD Bank, meanwhile, says its research shows the way consumers pay for their purchases is actually costing them money. Failing to prudently use a rewards credit card and cashing in accrued rewards is leaving money on the table. The survey found that 46 percent of consumers regularly pay for purchases with a debit or check card and 21 percent pay with cash. That means two-thirds of consumers could be earning generous cash rewards on gasoline, groceries, restaurant meals, and other purchases. TD Bank says it recently boosted the cash-back rewards on its credit card from two percent to three percent on restaurant charges. It also added grocery purchases as a new rewards category, paying two percent cash-back. 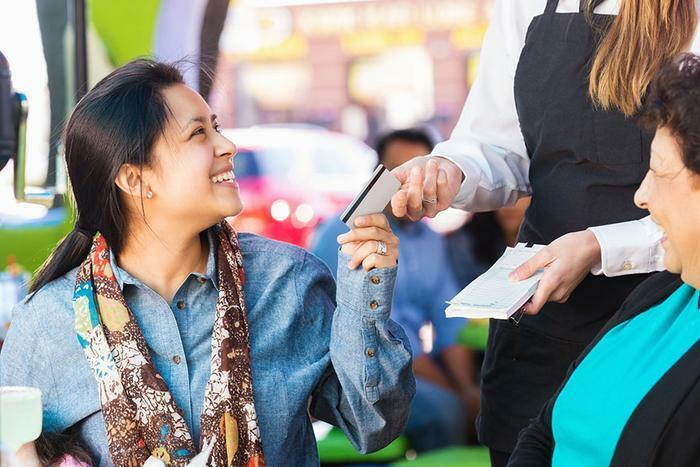 "If I could offer advice to consumers who use a credit card, it's to be sensible in spending and mindful about cashing in rewards," says Julie Pukas, head of US Bankcard and Merchant Solutions at TD Bank. Pukas says consumers need to be smart in the way they use their credit cards for daily purchases like groceries and dining, then have the discipline to pay off the entire balance at the end of each month. "For those who can make it work, it's a very savvy credit strategy that makes your credit card work for you," she said. It's one thing to rack up credit card rewards, but they don't help until you cash them in. Nearly one in five consumers with credit card rewards admit there have been times they let them expire. More millennials have a rewards credit card than any other generation, yet this age group is the one most likely to let their rewards go to waste. Pukas' advice? Go into your credit card account and automatically apply any rewards to each month's bill, ensuring the rewards get used before they expire.